Do you want to know how to get to Incheon airport from daegu (station)? There are many ways you can get to Incheon airport from daegu (station) such as public transportation (bus, subway / metro), taxi and Blacklink limo/transfer/shuttle service. Don't sweat outside waiting for other transportation with your luggage. Make a round trip reservation with Blacklink as you plan for your trip. It is easy, convenient and available 24/7. Then, the assigned Blacklink driver will greet you at the arrival and will drive you to the daegu (station). You can use Blacklink for not only hotel but also Gimpo Airport (GMP), Myeongdong, Jongno-gu, guesthouse, resort, airbnb, lodging and anywhere you want to go in Korea. Check out Blacklink customer review posted below. Dongseongno (동성로, 東城路) is the downtown of Daegu lying from the Daegu Station to Jungang pachulso (central police station) near the Banwoldang subway station in the center of the city Jung-gu. It has the Jungangno subway station as the nearest station from its heart. Like its name meaning the street in the east fortress, the eastern part of Daegu-eupseong (대구읍성, 大邱邑城, means the Daegu-Principality Fortress) was situated along this street. The fortress, however, had been demolished in the early 20th century. 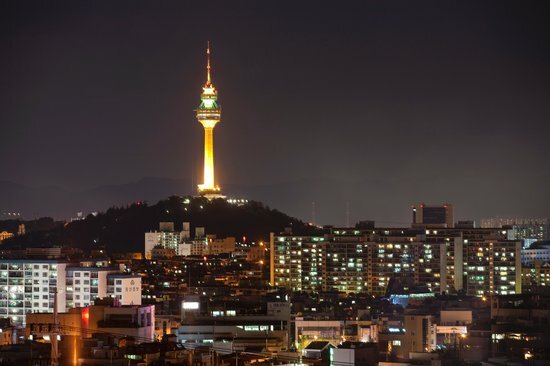 Although Daegu is the nation's third or fourth largest city, the Dongseongno area form the largest and the broadest downtown area in the whole country except the capital city, Seoul. In most cases, famous brands open their branch shop first here out of the Greater Seoul area. The sign of the Seomun Market Sub-downtowns in the city have its own commercial powers and colors. The area around the Seongseo Industrial Complex subway station in Dalseo-gu is a concentration of many amusement spots, and young people easily can be seen around Kyungpook National University in Buk-gu. Deuran-gil (means the street inside the field) in Suseong-gu is known for many restaurants. The city has a number of department stores. Many of these belong to national or multinational chains, but the local Daegu Department Store also operates two branches, while another local chain, Donga Department Store operates four in the city proper. The six department stores among them gather at the downtown. The traditional markets such as Seomun Market and Chilseong Market sell all sorts of goods.